Do you feel boxed in by life circumstances? Are you feeling overwhelmed, or frustrated by the issues of life? If you can identify with any of these questions, you need a breakthrough. Watchmen on the Wall Prayer Network and I want to personally invite you to come and experience the Supernatural Manifestation of Breakthrough. It’s your time to be renewed, restored, and refreshed. If you sense that God is calling you higher, or you need to be charged up, then this is one event you don’t want to miss!! God has commissioned two anointed and powerful women of God to usher you into your next realm, level, or dimension for this next season. Come expecting a divine encounter. 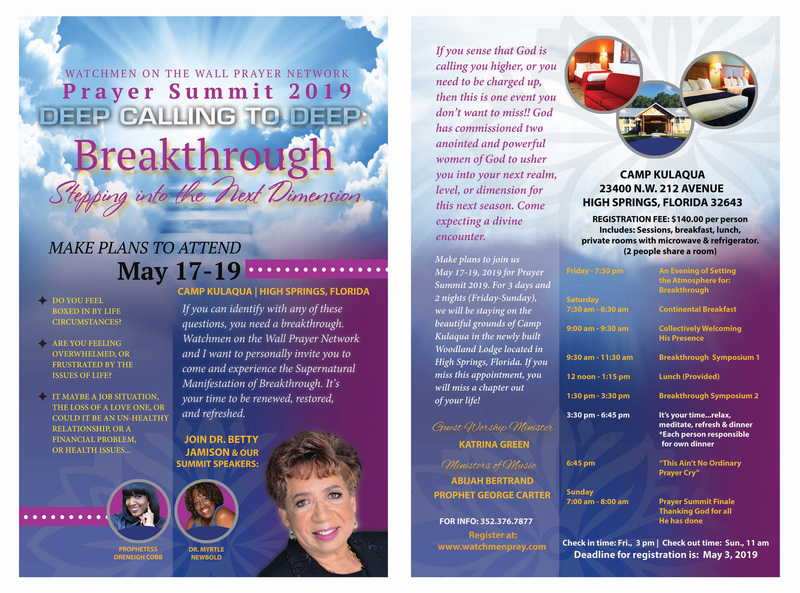 Make plans to join us May 17-19, 2019 for Prayer Summit 2019. For 3 days and 2 nights (Friday-Sunday), we will be staying on the beautiful grounds of Camp Kulaqua in the newly built Woodland Lodge located in High Springs, Florida. If you miss this appointment, you will a chapter out of your life! Click below to REGISTER NOW - Space is limited! We have a limited amount of spots left. Reserve your spot today! private rooms with microwave & refrigerator.